Fortnite, the sandbox video game, has become so popular that its maker, Epic Games, is offering up to $300 million in prize money for eSports tournaments. It is, in short, a gaming phenomenon that has attracted over 125 million active players. Which, if you’re a cyber-criminal, is a pretty spectacular offering of mostly non-security-savvy consumers to go after. Fortnite has is not available on Android….yet… which means the bad guys are having a field day. 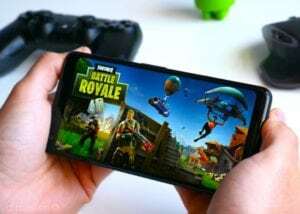 There is a scourge of fake Fortnite Android apps spreading around the web, looking to entice desperate mobile gamers that are hungry for a version they can play on their Galaxy devices. The Google search “Fortnite for Android” is one of the first auto-fill suggestions, indicating its popularity. Often these searches go to scam sites. There are even YouTube videos with links to scam versions of the game. Once a faux version is installed, it asks for more downloads, one after another. These scam apps can also spread spyware and malware. Scammers are using clever phishing and social engineering scams to take over accounts and monetize from other scams, such as free in-game money (VBucks). 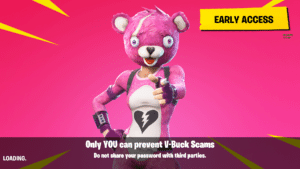 Epic Games developers are trying to educate players against risk with messaging that states “You can only buy V-Bucks through the in-game store.” But some users will click and fall for the promise of a free gift with scams selling fake V-Bucks in malicious apps, browser plug-ins, or Facebook quizzes. To reduce the risk of infection, make sure to update your device to the latest security protection, read reviews, and downloads from only trusted sources.